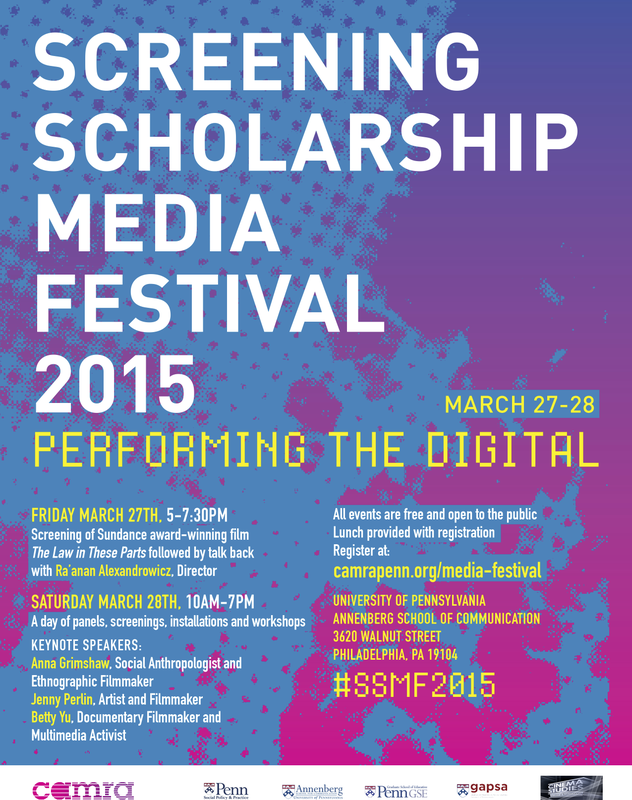 Screening Scholarship Media Festival – Register Now! 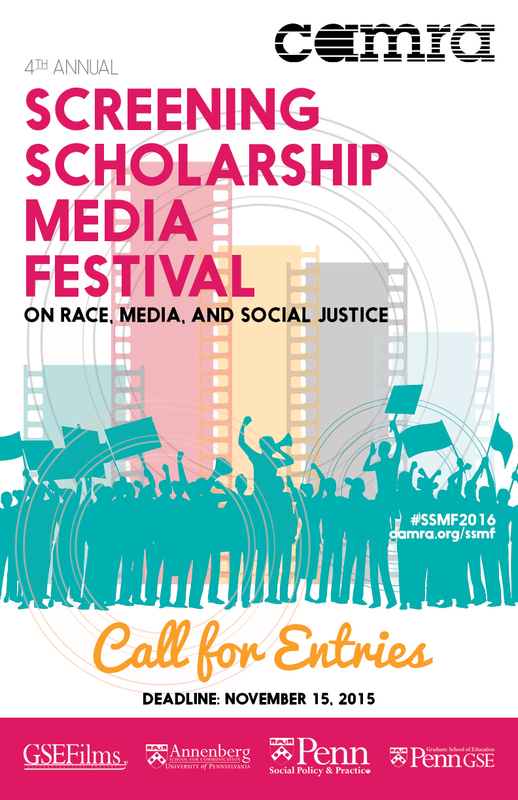 We are happy to announce that registration is open for the fourth annual Screening Scholarship Media Festival (SSMF) scheduled for April 1-2, 2016. This year, SSMF will highlight multimodal projects during two days of screenings and discussions showcasing film, soundscapes, recordings, blogs, websites, eBooks, animations, photographs, installations, and other media forms. This year’s theme is Race, Media and Social Justice. SSMF is hosted by CAMRA, the media pedagogy lab focused on using film, web platforms, social media, and other media technologies towards university research. WIC has partnered with CAMRA and in past festivals have featured student-created videos including the Rubber video from Lisa Mitchell’s class and the great work of our own Lindsey Martin. The festival begins on April 1st with a discussion between journalist and scholar Dr. Marc Lamont Hill and filmmaker Michele Stephenson on race in the contemporary moment. The second day, April 2nd will include a day of panels, screenings and discussions, featuring a keynote event with Dr Adrienne Keene, Dr. Todd Wolfson, Dr. Bianca Williams, Sandra Khalifa, and Tara Conley who will reflect on digital media and social activism as it relates to their respective expertise in scholarship, art, and activism. Registration is free and open to the public. To register or for a detailed schedule visit: http://camrapenn.org/ssmf/. If you have any questions, contact CAMRA at: ssmf@camrapenn.org. Also take a look back at what happened in SSMF 2015, 2014, 2013! This year’s festival, on April 1-2, 2016, has the theme of “Race, Media and Social Justice.” ​camra welcomes innovative submissions exhibiting original work that either engages with how racial difference and its attendant intersectionalities are constructed within a particular national or local context, or work that engages with a careful analysis and critique of mainstream and new media coverage of race and racialized thinking as it materializes in everyday life. Please visit the camra website to learn more about the theme and various categories of submission, and submit your materials before November 15. Check out our latest workshops or request a consultation session to help with your submissions! Also take a look back at what happened in SSMF 2015, 2014, 2013. "We explore the affordances and challenges of multimodal representational strategies in research, and we interrogate their social implications. SSMF is a hybrid between a traditional academic conference and a film/media festival." We are really excited to let everyone know about Penn CAMRA’s first annual media festival, on Feb 24 from 12pm to 7pm at Annenberg School for Communication. CAMRA, a media pedagogy lab, is a new collective of professors, graduate, and undergraduate students on campus which focuses on the use of film and other media technologies – web platforms, social media, etc – towards university learning and research. We know that university learning is currently at a crossroads: we’re all still reading and writing in classrooms even though most students on campus, including all of us, are immersed in video and web technology when outside of the classroom. We are extremely interested in working with anyone who wants to learn the technical aspects of these diverse media, how to integrate them into classroom learning, or how to infuse such technologies into research. The media festival will bring together members of the Penn community and scholars from around the country to begin these discussions in earnest. We really look forward to seeing you all as we begin to create a strong community on campus!